The environmental impact of fishing includes issues such as the availability of fish, overfishing, fisheries, and fisheries management; as well as the impact of fishing on other elements of the environment, such as by-catch. These issues are part of marine conservation, and are addressed in fisheries science programs. There is a growing gap between the supply of fish and demand, due in part to world population growth. Reefs are also being destroyed by overfishing because of the huge nets that are dragged along the ocean floor while trawling. Many corals are being destroyed and as a consequence, the ecological niche of many species is at stake. Some fishing techniques cause habitat destruction. Blast fishing and cyanide fishing, which are illegal in many places, harm surrounding habitat. Blast fishing refers to the practice of using explosives to capture fish. Cyanide fishing refers to the practice of using cyanide to stun fish for collection. These two practices are commonly used for the aquarium trade and the live fish food trade. These practices are destructive because they impact the habitat that the reef fish live on after the fish have been removed. Bottom trawling, the practice of pulling a fishing net along the sea bottom behind trawlers, removes around 5 to 25% of an area's seabed life on a single run. Most of the impacts are due to commercial fishing practices. A 2005 report of the UN Millennium Project, commissioned by UN Secretary-General Kofi Annan, recommended the elimination of bottom trawling on the high seas by 2006 to protect seamounts and other ecologically sensitive habitats. This was not done. In mid-October 2006, United States President George W. Bush joined other world leaders calling for a moratorium on deep-sea trawling, a practice shown to often have harmful effects on sea habitat and, hence, on fish populations. No further action was taken (Divek). the sea animals aquatic ecosystem may also collapse due to the destruction in the food chain. Additionally, ghost fishing is a major threat due to capture fisheries. Ghost fishing occurs when a net, such as a gill net or trawl, is lost or discarded at sea and drifts within the oceans and can still act to capture marine organisms. According to the FAO Code of Conduct for Responsible Fisheries, States should act to minimize the amount of lost and abandoned gear, and work to minimize ghost fishing. 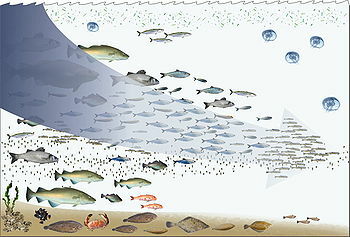 The fishing down the food web is something that occurs when overfishing arises. Once all larger fish are caught, the fisherman will start to fish the smaller individuals, which would lead to more fish needing to be caught to keep up with demand. This decreases fish populations, as well as genetic diversity of the species, making them more susceptible to disease, and less likely to adapt to their stressors and the environment. Additionally, catching smaller fish leads to breeding of smaller offspring, which can be problematic for fish. In many species, the smaller the female, the less fecund it is, impacting the fish population. Over-fishing can result in the over-exploitation of marine ecosystem services. Fishing can cause several negative physiological and psychological effects for fish populations including: increased stress levels and bodily injuries resulting from lodged fish hooks. Often times, when this threshold is crossed, hysteresis may occur within the environment. More specifically, some ecological disturbances observed within the Black Sea marine ecosystem resulted from a combination of over-fishing and various other related human activities which adversely affected the marine environment and ecosystem. Ecological disruption can also occur due to the over-fishing of critical fish species such as the tilefish and grouper fish who can be referred to as ecosystem-engineers. Fishing may disrupt food webs by targeting specific, in-demand species. There might be too much fishing of prey species such as sardines and anchovies, thus reducing the food supply for the predators. Disrupting these types of wasp-waist species may have effects throughout the ecosystem. It may also cause the increase of prey species when the target fishes are predator species, such as salmon and tuna. Shark finning is the act of removing fins from sharks and discarding the rest of the shark. The sharks are often still alive when discarded, but without their fins. Unable to swim effectively, they sink to the bottom of the ocean and die of suffocation or are eaten by other predators. Though studies suggest that 73 million sharks are finned each year, scientists have noted that the numbers may actually be higher, with roughly 100 million sharks being killed by finning each year. The deaths of millions of sharks has caused catastrophic damage to the marine ecosystem. Shark culling is the killing of sharks in government-run "shark control" programs. These programs exist to reduce the risk of shark attacks — however, environmentalists say that they do not reduce the risk of shark attacks; they also say that shark culling harms the marine ecosystem. Shark culling currently occurs in New South Wales, Queensland, KwaZulu-Natal and Réunion. Queensland's "shark control" program killed roughly 50,000 sharks between 1962 and 2018 — Queensland's program uses lethal devices such as shark nets and drum lines. Thousands of other animals, such as turtles and dolphins, have been killed in Queensland as bycatch. Queensland's shark culling program has been called "outdated, cruel and ineffective". The shark culling program in New South Wales (which uses nets) has killed thousands of sharks, turtles, dolphins, and whales. KwaZulu-Natal's shark culling program killed more than 33,000 sharks in a 30-year period. Recent research has shown that, by mass, fishing debris such as buoys, lines, and nets, accounts for more than two-thirds of large plastic debris found in the oceans; in the Great Pacific Garbage Patch, fishing nets alone comprise at least 46% of the debris. Similarly, fishing debris has been shown to be a major source of plastic debris found on the shores of Korea. Marine life interacts with debris in two ways: either through entanglement (where debris entangles or entraps animals), or ingestion of the debris (either intentionally or accidentally). Both are harmful to the animal. Marine debris consisting of old fishing nets or trawls can often be linked to phenomena such as ghost fishing, wherein the netting debris, referred to as ghost nets, continues to entangle and capture fish. A study performed in southern Japan on octopuses noted that there was an estimated mortality rate of 212,000–505,000 octopuses per year within the area's fishing grounds, due in large part to ghost fishing. Tracking garbage and monitoring the logistics of human waste disposal, especially waste materials primarily associated with fishing, is one method to reduce marine debris. Using technological or mechanical innovations such as marine debris-clearing drones can further serve to reduce the amount of debris within oceans. Recreational fishing is fishing done for sport or competition, whereas commercial fishing is catching seafood, often in mass quantities, for profit. Both can have different environmental impacts when it comes to fishing. Though many assume recreational fishing does not have a large impact on fish, it actually accounts for almost a quarter of the fish caught in the United States, many of those being commercially valuable fish. Since recreational fishing is not nearly as regulated or monitored as commercial fishing, this is large section of environmental impact that needs to be taken into account. Recreational fishing has its biggest impact on marine debris, overfishing, and fish mortality. Release mortality in recreational fisheries is the same as the impacts of bycatch in commercial fisheries. One method to increase fish population numbers and reduce the severity of adverse environmental impacts and ecological disturbances is the utilization of traditional fisheries management systems within fisheries. Essentially, traditional fisheries management incorporates the aspects of fisheries management; however, the conservation efforts take into account concepts that place restrictions on the type of gear used and the allotment of permitted angling. Traditional fisheries management also incorporates communities within its conservation efforts which often result in management scenarios where there is co-management conservation efforts led by communities. Ecosystem-based management of fisheries is another method used for fish conservation and impact remediation. Instead of solely focusing conservation efforts on a single species of marine life, ecosystem-based management is used across various species of fish within an environment. To improve the adoption of these types of fisheries management, it is important to reduce barriers to entry for management scenarios in order to make these methods more accessible to fisheries globally. Marine reserves serve to foster both environmental protection and marine wildlife safety. The reserves themselves are established via environmental protection plans or policies which designate a specific marine environment as protected. Coral reefs are one of the many examples which involve the application of marine reserves in establishing marine protected areas. There have also been marine reserve initiatives located in the United States, Caribbean, Philippines, and Egypt. To mitigate the negative environmental impacts of fishing within marine environments, marine reserves are intended to create, enhance, and re-introduce biodiversity within the area. As a result, the primary benefits arising from the implementation of this type of management effort include positive impacts towards habitat protection and species conservation. Based upon catch-and-release research, this method of mitigation involves several practices to reduce the negative environmental impacts of fishing that include: the duration, timing, and type of hook used during angling. To increase the effectiveness of catch and release fishing and mitigate its negative impacts, species-specific guidelines are required. These guidelines help tailor specific rules and regulations to specific species of fish in relation to their locations and mating and migration cycles. While catch-and-release fishing has been wildly used in recreational fishing, it is also beneficial for maintaining fish populations at a stable level for commercial fisheries to receive social and economic benefits. Combining catch-and-release fishing with biotelemetry data collection methods allows for researchers to study the biological effects of catch-and-release fishing on fish in order to better suit future conservation efforts and remedies. The environmental impact of recreational fishing may be alleviated to some extent by catch and release fishing. ^ "Global population growth, wild fish stocks, and the future of aquaculture | Shark Research & Conservation Program (SRC) | University of Miami". sharkresearch.rsmas.miami.edu. Retrieved 2018-04-02. ^ Worm, Boris; et al. (2006-11-03). "Impacts of Biodiversity Loss on Ocean Ecosystem Services". Science. 314 (5800): 787–790. doi:10.1126/science.1132294. PMID 17082450. ^ Blulab. "Destructive Fishing Practices and Bycatch - Ocean Threats | Slow Fish - Local Sustainable Fish". slowfood.com. Retrieved 2018-04-02. ^ "U.S. vows to work against destructive fishing". msnbc.com. 2006-10-03. Retrieved 2018-04-02. ^ Jennings, Kaiser (1998). The effects of fishing on marine ecosystems (PDF). Advances in Marine Biology. 34. pp. 201–352. doi:10.1016/S0065-2881(08)60212-6. ISBN 9780120261345 – via Elsevier Science Direct. ^ "FAO. Code of Conduct for Responsible Fisheries". www.fao.org. Retrieved 2018-03-30. ^ "Johannesburg Summit | Realidad social y desarrollo". ^ "Fishing Down through the Food Web". American Fisheries Society. 2015-07-18. Retrieved 2018-04-02. ^ Sonsthagen, Sarah A.; Wilson, Robert E.; Underwood, Jared G. (2017-12-01). "Genetic implications of bottleneck effects of differing severities on genetic diversity in naturally recovering populations: An example from Hawaiian coot and Hawaiian gallinule". Ecology and Evolution. 7 (23): 9925–9934. doi:10.1002/ece3.3530. ISSN 2045-7758. PMC 5723630. PMID 29238526. ^ Beldade, R.; Holbrook, S. J.; Schmitt, R. J.; Planes, S.; Malone, D.; Bernardi, G. (2012-06-07). "Larger female fish contribute disproportionately more to self-replenishment". Proceedings of the Royal Society B: Biological Sciences. 279 (1736): 2116–2121. doi:10.1098/rspb.2011.2433. PMC 3321707. PMID 22279163. ^ a b Daskalov, Georgi M.; Grishin, Alexander N.; Rodionov, Sergei; Mihneva, Vesselina (2007-06-19). "Trophic cascades triggered by overfishing reveal possible mechanisms of ecosystem regime shifts". Proceedings of the National Academy of Sciences. 104 (25): 10518–10523. doi:10.1073/pnas.0701100104. PMC 1965545. PMID 17548831. ^ a b c d Cooke, Steven J.; Suski, Cory D. (2005-05-01). "Do we need species-specific guidelines for catch-and-release recreational angling to effectively conserve diverse fishery resources?". Biodiversity & Conservation. 14 (5): 1195–1209. doi:10.1007/s10531-004-7845-0. ISSN 0960-3115. ^ Daskalov, Georgi M. (2002). "Overfishing drives a trophic cascade in the Black Sea". Marine Ecology Progress Series. 225: 53–63. doi:10.3354/meps225053. ISSN 0171-8630. ^ Coleman, Felicia C.; Williams, Susan L. (2002). "Overexploiting marine ecosystem engineers: potential consequences for biodiversity". Trends in Ecology & Evolution. 17 (1): 40–44. doi:10.1016/s0169-5347(01)02330-8. ^ Spiegel, J. (2000) http://heinonline.org/HOL/LandingPage?handle=hein.journals/bcic24&div=22&id=&page= "Even Jaws deserves to keep his fins: outlawing shark finning throughout global waters". Boston College International and Comparative Law Review, 24 (2): 409–438. ^ a b https://www.livescience.com/1027-shark-slaughter-73-million-killed-year.html Shark Slaughter: 73 Million Killed Each Year. Ker Than. September 26, 2006. Retrieved January 1, 2019. ^ https://ocean.si.edu/ocean-life/sharks-rays/shark-finning-sharks-turned-prey Ocean.si.edu. Shark finning: Sharks turned prey". Caty Fairclough. Retrieved January 1, 2019. ^ http://www.abc.net.au/news/2013-12-22/can-governments-protect-people-from-killer-sharks/5158880 "Can governments protect people from killer sharks?". ABC News. 2013-12-22. Retrieved January 1, 2019. ^ http://pursuit.unimelb.edu.au/articles/sharks-how-a-cull-could-ruin-an-ecosystem Schetzer, Alana. "Sharks: How a cull could ruin an ecosystem". puruit.unimelb.edu.au. Retrieved January 1, 2019. ^ a b c d https://web.archive.org/web/20181002102324/https://www.marineconservation.org.au/pages/shark-culling.html "Shark Culling". marineconservation.org.au. Archived from the original on 2018-10-02. Retrieved January 1, 2019. ^ a b http://www.sharkangels.org/index.php/media/news/157-shark-nets "Shark Nets". sharkangels.org. Archived from the original on 2018-09-19. Retrieved January 1, 2019. ^ https://www.nzherald.co.nz/world/news/article.cfm?c_id=2&objectid=11847758 "Man Who Devoted Life To Sharks, Killed Off The Coast Of Reunion". nzherald.co.nz. April 30, 2017. Retrieved January 1, 2019. ^ https://www.news.com.au/technology/science/animals/aussie-shark-population-is-staggering-decline/news-story/49e910c828b6e2b735d1c68e6b2c956e Aussie shark population in staggering decline. Rhian Deutrom. December 14, 2018. Retrieved January 1, 2018. ^ http://www.afd.org.au/news-articles/queenslands-shark-control-program-has-snagged-84000-animals Action for Dolphins. Queensland’s Shark Control Program Has Snagged 84,000 Animals. Thom Mitchell. November 20, 2015. Retrieved January 1, 2019. ^ https://www.ntd.tv/2018/09/04/video-endangered-hammerhead-sharks-dead-on-drum-line-in-great-barrier-reef/ Phillips, Jack (September 4, 2018). "Video: Endangered Hammerhead Sharks Dead on Drum Line in Great Barrier Reef". ntd.tv. Retrieved January 1, 2019. ^ Eriksen, Marcus; Lebreton, Laurent C. M.; Carson, Henry S.; Thiel, Martin; Moore, Charles J.; Borerro, Jose C.; Galgani, Francois; Ryan, Peter G.; Reisser, Julia (2014-12-10). "Plastic Pollution in the World's Oceans: More than 5 Trillion Plastic Pieces Weighing over 250,000 Tons Afloat at Sea" (PDF). PLOS ONE. 9 (12): e111913. doi:10.1371/journal.pone.0111913. PMC 4262196. PMID 25494041. ^ Lebreton, L.; Slat, B.; Ferrari, F.; Sainte-Rose, B.; et al. (2018-03-22). "Evidence that the Great Pacific Garbage Patch is rapidly accumulating plastic" (PDF). Scientific Reports. 8: 4666. doi:10.1038/s41598-018-22939-w.
^ Jang, Yong Chang; Lee, Jongmyoung; Hong, Sunwook; Lee, Jong Su; Shim, Won Joon; Song, Young Kyoung (2014-07-06). "Sources of plastic marine debris on beaches of Korea: More from the ocean than the land". Ocean Science Journal. 49 (2): 151–162. Bibcode:2014OSJ....49..151J. doi:10.1007/s12601-014-0015-8. ISSN 1738-5261. ^ Laist, David W. (1997). "Impacts of Marine Debris: Entanglement of Marine Life in Marine Debris Including a Comprehensive List of Species with Entanglement and Ingestion Records". In Coe, James M.; Rogers, Donald (eds.). Marine Debris. Springer Series on Environmental Management. New York, NY: Springer. pp. 99–139. doi:10.1007/978-1-4613-8486-1_10. ISBN 9781461384885. ^ a b c Sigler, Michelle (2014-11-01). "The Effects of Plastic Pollution on Aquatic Wildlife: Current Situations and Future Solutions" (PDF). Water, Air, & Soil Pollution. 225 (11): 2184. doi:10.1007/s11270-014-2184-6. ISSN 0049-6979. ^ Matsuoka, Tatsuro; Nakashima, Toshiko; Nagasawa, Naoki (2005-07-01). "A review of ghost fishing: scientific approaches to evaluation and solutions" (PDF). Fisheries Science. 71 (4): 691. doi:10.1111/j.1444-2906.2005.01019.x. ISSN 0919-9268. ^ a b Gregory, Murray R. (2009-07-27). "Environmental implications of plastic debris in marine settings—entanglement, ingestion, smothering, hangers-on, hitch-hiking and alien invasions". Philosophical Transactions of the Royal Society of London B: Biological Sciences. 364 (1526): 2013–2025. doi:10.1098/rstb.2008.0265. ISSN 0962-8436. PMC 2873013. PMID 19528053. ^ "Study In Science Reveals Recreational Fishing Takes Big Bite Of Ocean Catch". ScienceDaily. Retrieved 2018-04-02. ^ J., Cooke, Steven; G., Cowx, Ian (2004-09-01). "The Role of Recreational Fishing in Global Fish Crises". BioScience. 54 (9): 857. doi:10.1641/0006-3568(2004)054[0857:TRORFI]2.0.CO;2. ISSN 0006-3568. ^ a b c d e f Hilborn, Ray; Ovando, Daniel (2014-08-01). "Reflections on the success of traditional fisheries management". ICES Journal of Marine Science. 71 (5): 1040–1046. doi:10.1093/icesjms/fsu034. ISSN 1054-3139. ^ a b Pikitch, Ellen K. (2012-10-26). "The Risks of Overfishing". Science. 338 (6106): 474–475. doi:10.1126/science.1229965. ISSN 0036-8075. PMID 23112316. ^ Costello, Christopher; Gaines, Steven D and Lynham, John (2008) Can Catch Shares Prevent Fisheries Collapse? Science Vol 321, No 5896, pp 1678–1681. ^ A Rising Tide: Scientists find proof that privatising fishing stocks can avert a disaster The Economist, 18th Sept, 2008. ^ PLoS Biology - Can Farmed and Wild Salmon Coexist? ^ a b c d e f Roberts, Callum M.; Polunin, Nicholas V. C. (1993). "Marine Reserves: Simple Solutions to Managing Complex Fisheries?". Ambio. 22 (6): 363–368. JSTOR 4314106. ^ Aburto-Oropeza, Octavio; Erisman, Brad; Galland, Grantly R.; Mascareñas-Osorio, Ismael; Sala, Enric; Ezcurra, Exequiel (2011-08-12). "Large Recovery of Fish Biomass in a No-Take Marine Reserve". PLOS ONE. 6 (8): e23601. doi:10.1371/journal.pone.0023601. ISSN 1932-6203. PMC 3155316. PMID 21858183. ^ a b Donaldson, Michael R.; Arlinghaus, Robert; Hanson, Kyle C.; Cooke, Steven J. (2008-03-01). "Enhancing catch-and-release science with biotelemetry". Fish and Fisheries. 9 (1): 79–105. CiteSeerX 10.1.1.589.1499. doi:10.1111/j.1467-2979.2007.00265.x. ISSN 1467-2979. Hampton, J.; Sibert, J. R.; Kleiber, P.; Maunder, M. N.; Harley, S. J. (2005). "Changes in abundance of large pelagic predators in the Pacific Ocean". Nature. 434: E2–E3. Maunder, M.N. ; Sibert, J.R.; Fonteneau, A.; Hampton, J.; Kleiber, P.; Harley, S. (2006). "Interpreting catch-per-unit-of-effort data to assess the status of individual stocks and communities". ICES Journal of Marine Science. 63 (8): 1373–1385. doi:10.1016/j.icesjms.2006.05.008. Myers, Ransom; Worm, Boris (2003). "Rapid worldwide depletion of predatory fish communities". Nature. 423 (6937): 280–3. doi:10.1038/nature01610. PMID 12748640. Polacheck, T (2006). "Tuna longline catch rates in the Indian Ocean: did industrial fishing result in a 90% rapid decline in the abundance of large predatory species?". Marine Policy. 30 (5): 470–482. doi:10.1016/j.marpol.2005.06.016. Sibert; et al. (2006). "Biomass, Size, and Trophic Status of Top Predators in the Pacific Ocean". Science. 314 (5806): 1773–1776. doi:10.1126/science.1135347. PMID 17170304. Walters, C. J. (2003). "Folly and fantasy in the analysis of spatial catch rate data". Canadian Journal of Fisheries and Aquatic Sciences. 60 (12): 1433–1436. doi:10.1139/f03-152.